Pro-Russian militants launched 45 attacks. 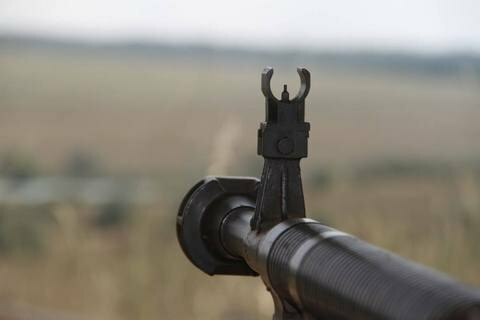 The Russian occupation troops fired on the positions of the antiterrorist operation (ATO) troops in Donbas 45 times on 14 April, wounding four servicemen, the ATO HQ press service has said. In the Mariupol sector, the enemy fired on ATO marines near Vodyane with 120-mm mortars, infantry fighting vehicle guns and heavy machine guns. Militants used 82-mm mortars near Krasnohorivka, APC guns, antitank grenades and heavy machine guns near Pavlopil, infantry fighting vehicle guns near Shyrokyne, and small arms near Hnutove and Talakivka. In the Donetsk sector, the militants used 82-mm mortars, grenade launchers of various times and heavy machine guns near Avdiyivka, Kamyanka and Zaytseve, 82-mm mortars against ATO strongpoints near Verkhnyotoretske, and heavy machine guns near Opytne. They opened fire with antitank grenade launchers and heavy machine guns near Pisky. In the Luhansk sector, the Russian occupation troops pounded Krymske and Katerynivka with 120-mm mortars and grenade launchers. Popasna came under fire from grenade launchers while small arms were used near Stanytsya Luhanska. As reported earlier, at the 12 April Minsk talks, Luhansk and Donetsk committed to a ceasefire starting from 10.00 on 13 April, however shooting did not stop.